MOON TOWNSHIP– Here is this weekend’s round-up of all the teams on the road this past weekend. RMU women’s lacrosse (7-3, 0-1 NEC) fell against the Wagner College Seahawks (8-2, 1-0 NEC) in a game where Robert Morris scored six of their seven goals unassisted. Four of the goals that Robert Morris scored came from both Sophia Eureka and Mackenzie Gandy. They each scored two goals. Meghan Crouse and Shannon Lynch each pushed forward a goal of their own without any help. The only goal that needed assistance was Kelley Flynn’s goal. Her goal was assisted by Melanie Gandy. Wagner scored nine goals in the first half, and eight in the second half to win over the Colonials 17-7 on Friday. The RMU track and field team finished third at the Towson Invitational on Saturday with a total of 74 points. Estelle Katende received silver in the discus with a distance of 43.89 meters. Sam Buck finished with bronze in the discus with a distance of 41.99 meters. Zoe Roush finished third in the long jump with a distance of 5.35 meters. Brooke Oldfin picked up silver in the 400-meter hurdles by finishing with a time of 1:03.00. Nina Radisavljevic finished third behind Oldfin in the 400-meter hurdles with a time of 1:03.45. Martha Gardner finished third in the 5,000-meter hurdles with a time of 18:38.18. Robert Morris participates in the Mason Spring Invitational on Saturday, April 13 all day in Fairfax, Va.
Robert Morris softball (9-25, 2-3 NEC) lost the first game of a weekend Northeast Conference doubleheader against the Saint Francis University Red Flash (16-20, 4-1 NEC) by a score of 6-5 on Saturday. Brittney Seibert scored four RBIs, and Taylor Bartlow scored one for Robert Morris in the loss. The first two RBIs came on an RBI double in the top of the second inning by Seibert. Bartlow scored her lone RBI in the top of the fourth inning with a home run to left field. Seibert scored her other two RBIs with a home run to center field. Saint Francis scored two runs in the bottom of the second inning and three in the bottom of the third inning. They scored the go-ahead run in the bottom of the sixth to end the game with a 6-5 victory. The Colonials softball team (10-25, 3-3 NEC) bounced back against the Saint Francis University Red Flash (16-21, 4-2 NEC) in the second game of their Saturday NEC doubleheader. After the Red Flash scored one run in the bottom of the first inning, Robert Morris managed to wreck Saint Francis’ chances of a Saturday sweep when they put up seven runs in the top of the second inning. Robert Morris capped off their afternoon with a two-run and three-run home run in the sixth and seventh inning respectively to win past SFU 12-4. Robert Morris plays against the Niagara University Purple Eagles (4-21, 3-5 MAAC) on Tuesday, April 9 at 3 p.m. in a doubleheader. RMU rowing participated in the Cooper Invitational over the weekend with a variety of results. Robert Morris finished third in the first heat of the women’s second varsity eight event with a final time of 7:45.03. In the petite final of the women’s second varsity eight, Robert Morris finished third with a time of 7:43.99. In the petite final of the women’s varsity four, RMU finished with a time of 8:55.03 to finish in third place. 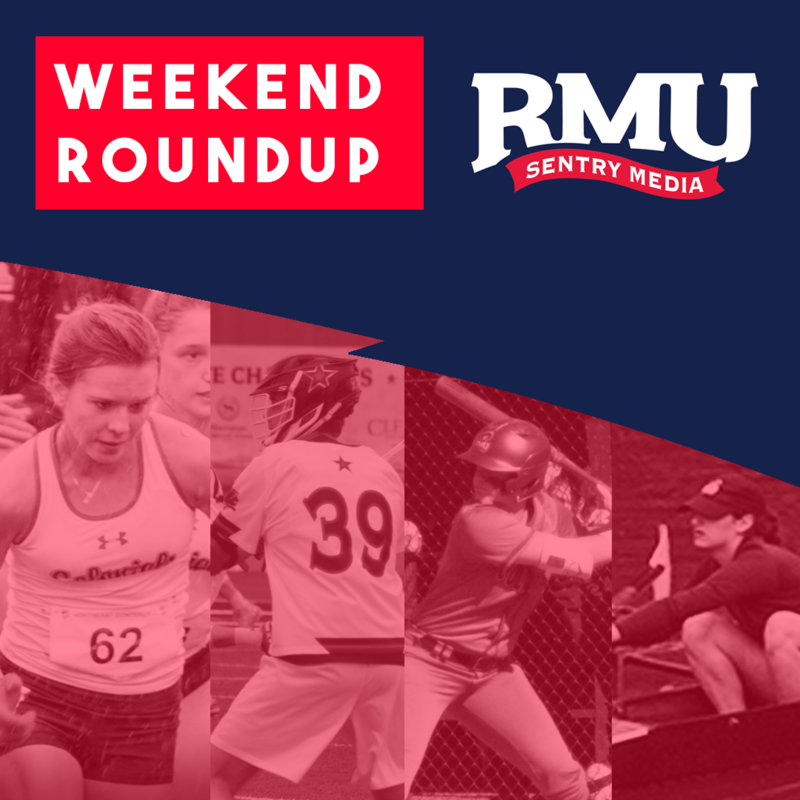 Rowing next participates in the Canisius Invitational on Sunday, April 28 in Buffalo, N.Y.
RMU women’s lacrosse (7-4, 0-2 NEC) lost in unsightly fashion against the Mount St. Mary’s Mountaineers (10-2, 2-0 NEC) 14-3 on Sunday. Thalia Zolis scored the first goal at the beginning of the game and then Zolis scored again at the beginning of the second half for two of RMU’s goals. Shannon Lynch scored their third and final goal of the game. All three goals were unassisted. MSM scored six goals in the first half and eight in the second half to win over the Colonials 14-3 on Sunday. Robert Morris will try to turn their NEC record around when they host the Saint Francis University Red Flash (3-7, 0-2 NEC) on Friday, April 12 at 3 p.m. at Joe Walton Stadium.